On February 28, viral website LittleThings posted its last piece, stating that would be its last day of business. The website, which saw much of its traffic come from Facebook, had become the first victim of the social network's algorithm change, which de-prioritized posts from brands and publishers. LittleThings had nearly 60 million comScore unique viewers, including 7 million millennials, at its height and more than 24 million social-media followers. Earlier this week, digital media company RockYou announced it had acquired LittleThings, effectively bringing it back to life. “We remain committed to the original values of the brand and will continue creating exceptional content for its followers, while expanding LittleThings onto new platforms:” Lisa Marino, CEO, RockYou Media, stated. So how will the site now thrive? Video monetization platform Telaria’s CEO Mark Zagorski has a few ideas. According to Zagorski, RockYou Media’s ad tech capabilities and integrations are diversified in a way that will help LittleThings “build more diverse revenue streams.” Also, the company’s relationship with advertisers will allow the publication to become less reliant on Facebook revenue shares. “Whether it’s Google’s search science or Facebook’s feed prioritization, the fates of publishers have become increasingly reliant on digital industry behemoths to do what should be part of their core charter: attract and retain readers,” Zagorski told Publishing Insider. Since the shuttering of LittleThings, several other sites have closed, due to Facebook’s algorithm change, including conservative site Rare. Though LittleThings was saved by an acquisition by a larger media company, what it does next could serve as a model for other publications struggling to regroup and survive. 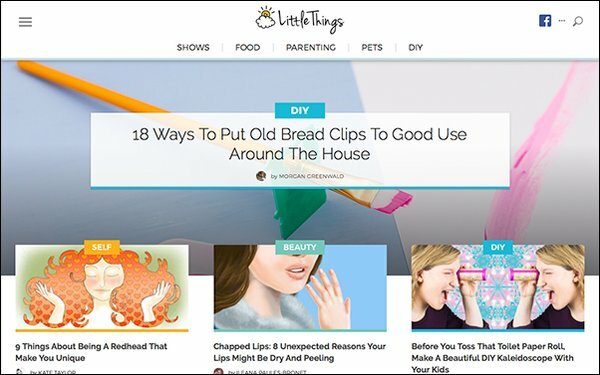 Maia McCann, editor-in-chief/executive vice president programming at LittleThings, stated on a panel hosted by MediaRadar earlier this month that the website had seen traffic slowing before the change. It wasn’t one precipitous drop. However, the algorithm change crippled the site, which had failed to diversify audience streams during its four years. Krizelman also notes that while panel representatives from Business Insider, Little Things and Hearst all agreed that diversifying was key, none knew of a “silver bullet” for monetizing content. They still rely heavily on Google.